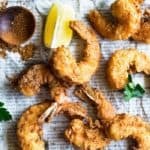 Classic fried shrimp made with a seasoned cornmeal flour filled with wonderful flavors and fried to perfection. This dish is perfect for your next fish fry. In a brown bag or ziploc bag, add flour, cornmeal, seasoned salt, pepper, cayenne, lemon pepper, and paprika and shake together. In a deep pie plate or large shallow bowl, whisk together buttermilk, egg and hot sauce. Dip shrimp in beaten buttermilk mixture then add back into the cornmeal breading and shake liberally to coat well. Place coated shrimp on a baking sheet. While coating sets, add 2 - 2 1/2 inches of oil to a deep pot and heat over medium high heat.